When I was hiding I wasn’t in a position to think about home. All I wanted was to survive, nothing else. Even when I was hiding in someone else’s home, there was no security, because at any moment someone could come and knock on the door and find you. Marie Chantal Uwamahoro (known as Chantal) was born into a large family in the northern part of Rwanda. She was the youngest of eight children, growing up in a very happy home. Their father was a well-respected local educator who had taught many of the local community. People often told him how much they had enjoyed being in his lessons. However, Chantal’s family were different from their neighbours; they were the only Tutsi family in a village of Hutus. At primary school, she felt isolated from the other children, who were all Hutus. They would not mix with her or include her in their games. She remembers them calling her names such as ‘cockroach’ or ‘snake’. Even the teachers subjected her to discrimination, asking all of the Tutsis in the room to stand, knowing that Chantal was the only one. They treated her unfairly – no matter how hard she studied, she knew that her work had to be better than her peers to receive the same recognition. When she moved to secondary school, she made friends with the small group of Tutsi students – about 30 out of 500 people. She made friends with a few Hutu students, but she was always aware she was part of a minority. The Headmistress was a Canadian Catholic nun, who openly criticised the Tutsis, spreading rumours and lies. She was an influential figure, and the other children distanced themselves from Chantal and the other Tutsis. She felt isolated once again. Chantal’s father was regularly stopped by Rwandan government officials and beaten by neighbours, just for being a Tutsi. He tried to mix with local Hutus whenever he could, to try to protect his family. Eventually, he sent Chantal to the capital city of Kigali, to stay with her brothers, Alexis and Kizito, for safety. In 1992 her father died from the injuries he had received over many months of mistreatment at the hands of the authorities. Her mother fled with the rest of the family to join Chantal in Kigali, where they lived with her brothers. Alexis had owned a pub in a predominantly Tutsi area, so was well known locally. He had been regularly harassed and imprisoned by government forces, who suspected him of being a member of the Rwandan Patriotic Front (RPF). On 6 April 1994, news came through that the Rwandan President had been assassinated. The President was a Hutu and, fearing there would be a dangerous consequences for the Tutsi community, Chantal’s brother warned his family that ‘this is the end of all of us’. The following day, Rwandan radio told everyone to stay indoors for their own safety. In reality, it meant that Tutsis would be at home when the killing began that night. Tutsis quickly became the target of the Interahamwe - a militia group backed by the government. Chantal’s family were often woken up in the middle of night by the sound of Interahamwe banging on the door. They would never answer it. On 14 April, the knocking was so loud that Chantal’s mother decided to answer the door. They pushed her mother to the floor and demanded to see Alexis and Chantal’s brother, Kizito. They searched the house, found Chantal hiding under the bed, and beat her. Her brothers had been hiding in separate houses in the compound, but when they heard the noise, they gave themselves up in the hope the attackers would leave their mother and sister alone. They dragged Chantal and her brothers out into the street, where they were beating other Tutsis to death. The leader of the group of Interahamwe told the others to start killing all the men. Chantal felt helpless watching the merciless killing around her. Her brothers were beaten with heavy pieces of wood until they fell to the floor, then attacked with machetes. Chantal remembers lying on the floor and thinking how the murderers looked like they were enjoying inflicting all this pain and suffering on their victims. These painful memories stay with her today. Under the constant threat of discovery, Edith decided to move her family to a town in central Rwanda where they would be safer. The journey was dangerous, but Edith helped them all get there safely by hiding them in the back of a car. In their new home, Chantal once again hid in the bushes if there were searches taking place. One day while she was hiding, soldiers surrounded the bush. She felt sure she would be killed. Two men in uniforms approached her and told her to come to them. They identified themselves as RPF soldiers, reassuring her saying: ‘you are safe’. Chantal didn’t speak about her experiences for twenty years, until her daughters asked her about her life in Rwanda. 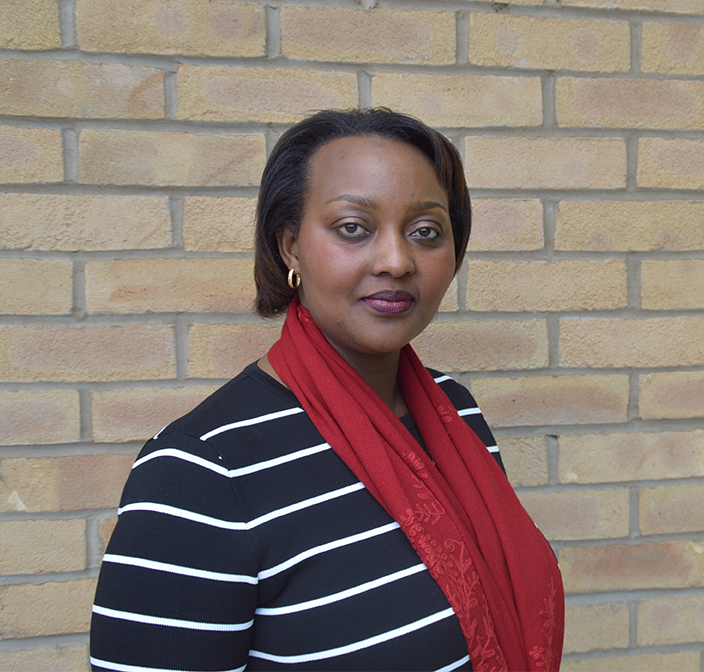 Today, she speaks to many different groups to help them understand the genocide and is the Deputy Chair of URUMURI, helping other survivors of genocide and raising awareness of the Genocide in Rwanda in the UK. She goes back regularly to Rwanda, because she says something has changed there now – it is more like home again.